The corroded revolver discovered in a field in the area where Van Gogh shot himself is to be sold, with an estimate of €40,000-€60,000. It is coming up for sale in Paris on 19 June with ArtAuction Rémy le fur at Drouot. The auctioneers describe it as “the most famous weapon in art history”. The gun was apparently dug up in around 1960 by a farmer in a field behind the château in Auvers-sur-Oise, the village north of Paris where the artist spent his final 70 days. I first heard about the revolver in the mid 1990s from Claude Millon, a local writer, and she later mentioned it in her 1998 book, Vincent van Gogh et Auvers-sur-Oise (a source unrecorded in the auctioneer’s bibliography). In 2012 Alain Rohan published a booklet on the discovery (Vincent van Gogh: Aurait-on retrouvé l’arme du suicide? ), although this attracted surprisingly little attention. 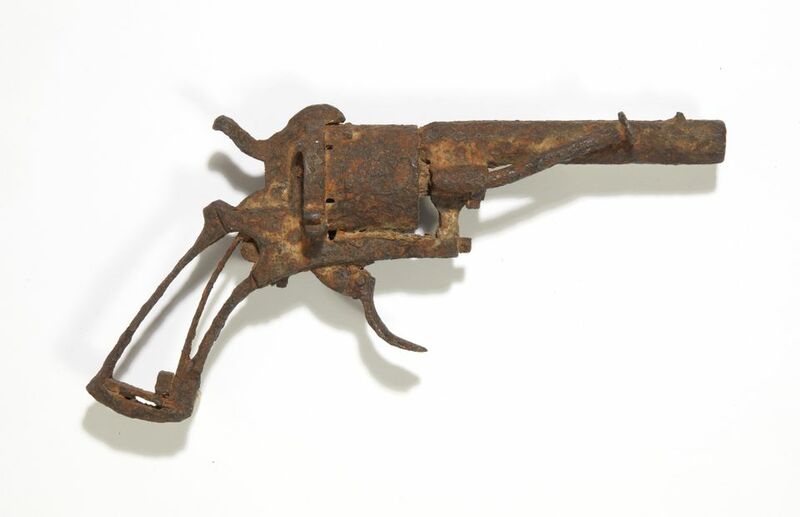 The severely corroded weapon now being sold is a Belgian-manufactured Lefaucheux pinfire revolver, which was among the most popular civilian handguns in the second half of the 19th century. It remained in production until 1893. But is the gun coming up for the sale the one that ended Van Gogh’s life? Analysis by specialists has shown that it had remained buried in the ground for well over 50 years. The trigger had corroded in the unlocked position, suggesting that it may well have been fired just before being lost or abandoned. The calibre of the Lefaucheux is 7mm, as stated by Dr Paul Gachet, who treated Van Gogh’s wound. The location of the buried gun matches that recorded by Dr Gachet’s son. Putting all the evidence together, it is very likely that the Lefaucheux is indeed the gun which killed Van Gogh, although this is not certain. The revolver has only been exhibited once, in the Van Gogh Museum’s 2016 exhibition On the Verge of Insanity: Van Gogh and his Illness. The Amsterdam museum’s catalogue concludes that “there is a strong possibility that he used it in his suicide attempt”. The shooting took place in the early evening of 27 July 1890. Van Gogh managed to stagger back to the inn where he was staying, a distance of nearly a kilometre. He died in his small bedroom around 30 hours later. The Lefaucheux revolver has limited firepower, so this may explain why the bullet apparently ricocheted off Van Gogh's ribs and became embedded in his chest, rather than reaching his heart and causing instant death. Although the Van Gogh Museum and most specialists believe that the artist committed suicide, a 2011 biography by two American writers, Steven Naifeh and Gregory White Smith, argues that he was shot by a local lad, René Secrétan. This hypothesis was also accepted by Julian Schnabel in his new film, At Eternity’s Gate. However, the evidence of suicide is overwhelming. One of the mysteries of Van Gogh’s death is how the artist acquired the revolver. The artist never owned a gun and there is no evidence that he ever used to shoot. He probably ended his life with a gun that belonged to Arthur Gustave Ravoux, the owner of the inn where he was staying, most likely taking it without permission. So what is the provenance of the gun which is coming up for sale? According to the auctioneer, Grégoire Veyrès, the farmer who came across the weapon in his field gave it in around 1960 to the then owner of the café which had originally been the Auberge Ravoux. The finder probably thought that the gun had no great financial value. Although Veyrès is not naming the family, the café was at that time owned by Roger and Micheline Tagliana. Their daughter is believed to be the present owner of the revolver. And what will happen at the sale? It is very difficult to guess what the corroded gun will fetch, but the price may soar. One only hopes that it will go to a responsible buyer who will not exhibit it as a gruesome relic—but treat it with the respect that it deserves.